In the search for professional music production equipment, few pieces of gear are as important as the headphones. Computers can be upgraded and all DAWs can be managed with enough mastery–even MIDIs can be massaged–but headphones either produce a clear and accurate sound or they do not. Unfortunately, if you are looking for a pair of studio or monitor headphones, chances are you are going to have to shell out hundreds of dollars or simply learn to make due and hope the final master does include any unsightly artifacts or auditory miscues. Or you could always pick up a pair of Beyerdynamic DT 770 Pros and prepare for your mind to be blown as this Beyerdynamic DT 770 pro 250 ohms review will show. Whether you are a neophyte trying to claw your way into the industry, a seasoned amateur trying to find a great value, or a grizzled professional simply in need to true, studio-quality cans, the Beyerdynamic DT 770 Pro 250 Ohms has something for everyone. To be clear and before we get into a lengthier digression regarding the pros and cons of these headphones, none of the cons should be taken as a universal flaw. Instead, the cons merely serve as a guide for understanding the intended audience. Still, this Beyerdynamic DT 770 pro 250 ohms review should ultimately be seen as a glowing recommendation for anyone who mixes or masters music. This where a pair of can lives of dies, and for the DT 770, you should expect a long and healthy life. When looking for studio or monitor headphones, you should definitely not try to find a pair that you would use for casual listening as that is not their intended purpose. This holds true for the DT 770 Pro as the sound quality is designed for accurate and analytical replication–not simply to jam out. That is not to say that these headphones would perform poorly in that context, but the high impedance will definitely limit the source hardware to get the most out of them. Keep in mind, this will not actually affect the sound quality itself, but when connected to certain devices–especially those without amplification features–these cans can be fairly quiet. Regardless, whether the source provides enough power to truly push these headphones or not, you will note how clear everything sounds on the DT 770 Pro. Every nuance, every voice, and yes, every mistake or artifact will be nigh-perfectly replicated such that you may experience the sensation of hearing music you have listened to a million time before as though it were the first time. It is even entirely possible that you learn to love a song you once hated due to its refined complexity or possibly sour on a song you loved once you hear flaws that were otherwise hidden by inferior headphones. Regardless the result of your subjective experience, the one thing you will not be able to deny is that the sound is as true as you have ever heard. Though, it should be noted that the DT 770 Pro does aim, and succeed, at providing a somewhat specialized soundscape. Specifically, these headphones are not the best option if you are a bass head. Granted, even producers of bass-heavy music need accuracy to their sound when mastering, but these headphones do have a tendency to lean more towards a brighter sound as opposed to dark–which is another reason they may not be ideal for casual listening. For a pair of casual headphones, comfort will often be important. However, for a pair of studio or monitor headphones that are generally expected to be worn for hours on end days at a time–especially if you are a professional or semi-professional music producer, comfort is almost as important as sound quality. Not really, but then again…almost. When it comes to the DT 770 Pro, this will not be an issue at all. For one, the circumaural cup design is large enough to cover your ears without being so large that the headphones sag. On top of that, the headband uses steel springs that provide a secure, but not tight, 3.5 N of pressure. Finally, the DT 770 Pro comes with both a set of PVC cups as well as a set of silky, smooth velour cups. In practice, these headphones can easily pass the 4 to 5-hour mark without giving you the slightest bit of wear fatigue. 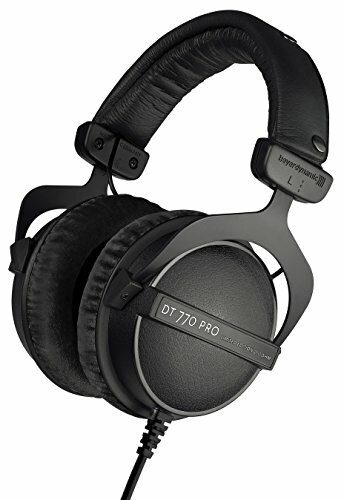 That said, you will likely want to give your ears a chance to periodically air out as the DT 770 Pro are designed to offer decent, though not perfect, noise isolation of up to 18 dB. As such, airflow is restricted to ensure the sound quality is not compromised by ambient noise. If you were not otherwise abreast of Beyerdynamic, you might be interested to know that they have manufactured in Germany–a country renowned for its attention to detail and quality of build for their products. For the DT 770 Pro, all of those benign stereotypes are only proven accurate as these headphones are legitimately impressive. First, as already mentioned, the headband features a steel spring. While this ensures that the headphones will not jostle from their position, it also means that you do not have to worry about the spring losing its rigidity. The ear cups too are somewhat unusual in that they are more or less upholstered in a faux leather-like material that is likely either polyurethane or polyvinyl chloride. Altogether, the DT 770 Pro is a great pair of headphones that is built to last. That said, even if something happens to them, you do not have to worry about going out and replacing the entire product, because every part and component of the DT 770 Pro is replaceable. In fact, this is arguably why they can conceivably last forever and is definitely a less common feature among professional-grade studio or monitor headphones. If you have worked at the highest levels of music production, then you will not be misled into believing that the Beyerdynamic DT 770 Pro can truly compete with a set of cans that cost almost, if not more than, $1000. Of course, even if you do have experience using elite headphones, you are unlikely to find many quibbles with the DT 770 Pro either. For the purposes of mixing and mastering music, there is little not to love about the DT 770 Pro. With an incredibly accurate sound that rings crystal clear, you will not miss a beat while working long into the night in the studio. Even better, you may not even notice as these headphones are as comfortable as any and do a great job eliminating distracting ambient noise.